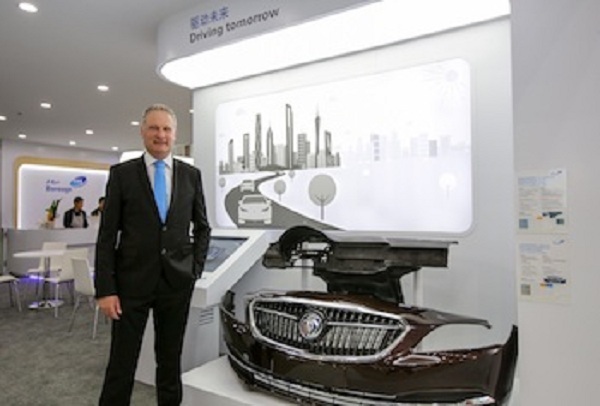 Polypropylene (PP) has an even greater role to play moving forward in the automotive sector according to supplier Borouge Jost Erich Laumeyer, Vice President, Marketing Centre Mobility at Borouge Sales and Marketing (Shanghai). says short glass fiber-reinforced PP is but one example, although in this case it has the potential to replace costlier PP compounds that employ long glass fibers for reinforcement in auto applications such as front end modules, something that is already progressing in Europe. “Such applications are commonly over-engineered,” notes Laumeyer but in markets such as China where steel is still commonly used, the market may switch directly to the short glass fiber solution. “Glass fiber [33%] PP compounds are also commonly used in air intake manifolds for 1.0- and 1.6-L non-turbo engines and we are targeting beyond these engine sizes and heat exposures, and this is something we are confident of achieving,” says Laumeyer. Carbon fiber-reinforced PP compounds, meanwhile, are in the pre-marketing phase in Europe while several projects are also underway in China. Structural components are the most promising application. “The price of the package is not important. If you can replace steel with plastic and reduce the number of components, the system cost will come down,” notes Laumeyer. Start-ups who are designing and electric vehicles also represent fertile ground for PP deployment. “Typically, their background is electronics and not auto, and they are boundaries and ideas differ from established OEMs, who I think can actually learn from them.” Pre-colored metallic look PP body panels are a key area for development, and Laumeyer feels that converters in the bumper molding business are well placed to exploit opportunities. Short glass fiber-reinforced PP foam molding using the MuCell process is also being promoted by Borouge as a lightweighting strategy. “PP compounds need to be tailored for the process, but 8% lightweighting is achievable,” says Laumeyer.